Using 14 different crosses and 14 different wildflowers in the churchyard we will take you on a walk through the old and new testament. 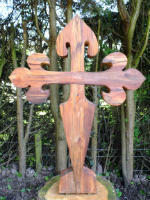 The crosses were designed and carved by Ant Beetlestone (www.antbeetlestone.com) and are placed on wooden and stone plinths. We hope that churches and other organisations will use the Walk Through the Bible for retreats, consequently a number of prominent theologians have provided meditations on a cross or flower. 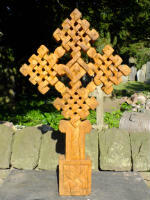 For example, the Reverend Tim Heaton, author of “The Long Road to Heaven: A Lent Course Based on the Film The Way” has provided a reflection on the Cross of St James. Funding for this project was provided by The Jane Hodge Foundation, The Jerusalem Trust and Westhill Endowment Fund. 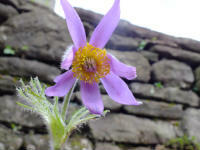 Pasqueflower (Pulsatilla vulgaris) - the flower for Easter can be found with the Cross of Nails. Ethiopian Cross (Acts 8:26-35) – tells the story about Christianity spreading around the world, we meet the first Ethiopian Christian, a Minister in government, who meets the evangelist Philip as he was travelling home from Jerusalem. If you would be interested in bringing a group to visit the walk please contact us via email which can be found on our contacts page.